I'm so glad you're here today...you're in for a treat! Some of our regular readers may be familiar with Wolff Den Press and fine artist, Michelle Wolff. She creates custom portrait art in graphite, charcoal and pastel. One of her specialties is pets. Michelle has been a long-time friend and reader of GLOGIRLY, so when she contacted us about creating a portrait of ME, we were so touched. And when she agreed to offer a custom portrait to one of our readers...well, we were speechless. And as you know, that doesn't often happen. Glogirly sent Michelle a photo of me to work from. And in just a few days, we received an email with a picture of Phase 1. Michelle works in steps and it was fascinating to see the progress and watch the final portrait develop. The three images above show the first, second and final phases. WAFFLES: Hey Boss? Is that you? Whatcha doin' inside that frame? KATIE: Waffles, I'm right here. That's my portrait inside the frame. WAFFLES: Yeah, I was wondering why it wasn't bossing me around. KATIE: My portrait is drawn on 17" wide by 11" high archival quality paper which will last a lifetime if properly framed. We cropped it just slightly on the sides and placed it in a 17" square frame with a 3" black mat, which we think makes the portrait really pop. WAFFLES: So Boss, which wall are we going to hang you on? KATIE: No one is hanging me on anything, Waffles. But I bet our friends would like to see my portrait's new home. KATIE: Waffles, just remember. Whenever you're eating, whenever you're looking out the window, or climbing the cat tower... I'm watching you. 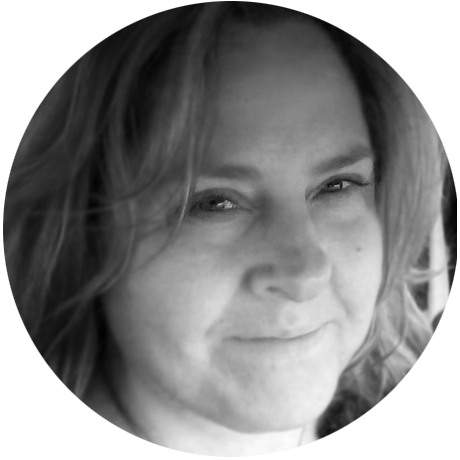 You can find Michelle on Etsy where she has lots of details regarding sizing and pricing. She also has some wonderful examples of her work on her website, Michelle Wolff Custom and Fine Art. Her timetable varies based on what she's got on her drawing board, usually 2-6 weeks. And she ships WORLDWIDE! High-resolution scan of actual finished artwork. Click to biggify. KATIE: Michelle did such a beautiful job with my portrait. The intricate details of my markings, whiskers, and all those little white hairs are remarkable. But the eyes... the eyes make it pure-Katie. Portrait Giveaway - Open Worldwide! 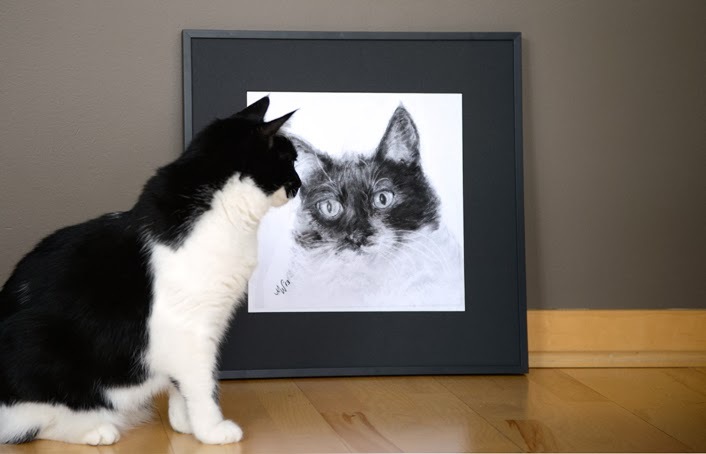 Leave a comment telling us about the pet you'd most like to have a portrait of. Earn extra entries by following Wolff Den Press and GLOGIRLY on our social media channels. Earn even more entries by sharing this giveaway on Facebook, Twitter, Pinterest or Google+. Just leave a separate comment for each extra entry. No need to provide links to your shares. Giveaway is open to GLOGIRLY readers worldwide. Winner will be randomly selected using Random.org. Winner will be notified via email and must reply back within 48 hours to claim their prize. Winner will be given instructions on how to contact Michelle Wolff to begin the process of their custom portrait. Winner will be announced in a separate post following the drawing. No purchase necessary. Void where prohibited. "I started drawing in 2010 after leaving a very demanding career and wanting to express creatively beyond words (I'm a published writer) as my career had left my well dry. I found that drawing portraits and focusing on the eyes quickly became my favorite. I love drawing people and animals and try hard to capture the essence of the subject through the eyes. In a 2011 snowstorm we found a 2 week feral kitten and began a journey into the feline world that quickly created a passion in me for feral cats and their plight of which before her I'd known nothing. It's been interesting to say the least! This blog post and giveaway are sponsored by Wolff Den Press, which means we were paid to create and feature this content. Regardless of the payment received, we only feature products and services on GLOGIRLY that we use or feel our readers would benefit from using. All sponsored posts on GLOGIRLY will always reflect our honest and unbiased opinions. We would love that! And to have a picture of ME (Chey) would be amazing! Oh that would be better than the best. Oh my goodness how would I choose? OMC!!! LOVE LOVE LOVE!!! 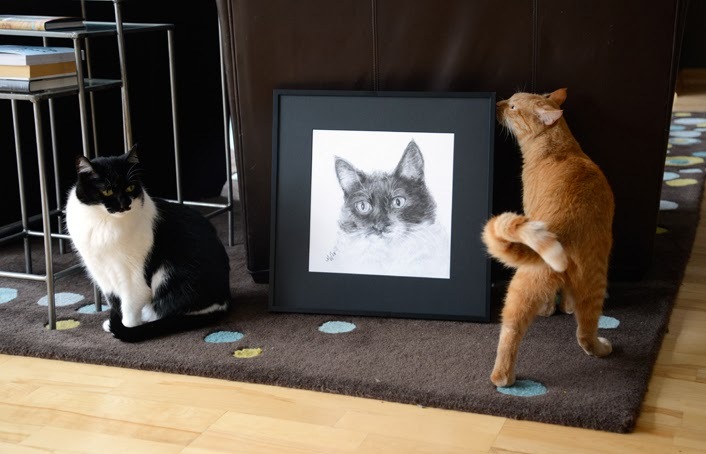 We'd want a portrait of... MEEEEEE! d'Artagnan Rumblepurr! We've followed Wolff on FB. We've followed Wolff on Twitter. We follow Glogirly on FB. We follow Glogirly on Pintrest. Oh, we would love to have a portrait of Arty Mouse, we misses her so much. We liked Wolf on Facebook. I'd love to have one of my gal KonaKitty! We followed Wolf on Twitter. I'd love to have one of my gal KonaKitty! And we follow on FB! I'd love to have a portrait of my own special furry-boy - Kobe - a former feral kitten who has grown from a handful to a enormous bundle of furry love. He is my furry soulmate. I'd love to have one of my gal KonaKitty! And AND we followed Wolff Den on FB! What an amazing giveaway! I would love to have a portrait of Simon. I recently lost him just two months shy of his 10th anniversary (gotcha day). He was the catalyst for my rescue work, taking in four more FIV+ boys, becoming a cat person, and oh so many other things that I can't even begin to list. The most devastating loss EVER! I still can't talk about him w/o falling apart. Wow! Cool! We would love a chance to win. We shared this on Mommy's FB profile. We already follow you on FB. Oh I would pick Pricilla. She would look beautiful don't you think? We have now liked Michelle's FB page. We shared this on Mommy's Pinterest. We've facebooked, twittered, and pinterested and just linked you up 4 times on our blog post! Whew! I'm not going to do the multi entries since I won in the last great giveaway, but I wold love to have a portrait of BratCat since we will lose him far too soon to his A.R.D.S. That portrait is amazing! I'd love to get one of my Pop. I mean FOR my Pop. Heh heh. You look fab, Katie. You know where to find me. Oh wow, my mom would love to have a portrait...oh who....me...my momma Ellie...me...Ellie mom....me? We Like Wolff Den Press on FB. WOW! That is an amazing portrait, Katie! I would love to have one like that of me, so I would love to be entered! Wow, such beautiful work! 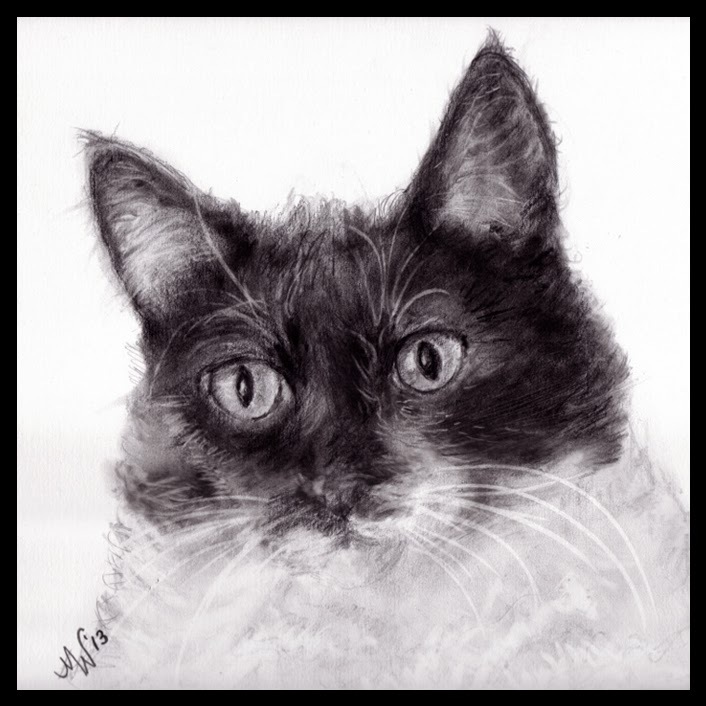 I would love to be able to give a portrait of my mother's cat, Neko, to her... Neko was like a child to Mom and we lost her way too early due to kitty emphysema. Our mum would love one of these. Especially if the picture could have our older brother and sister and our little brother in it (they are all living at Rainbow Bridge now) because our mum still misses them very much. Our older brother had lung cancer, our sister's liver stopped working and our little brother was killed by a bad dog. We're connected Wolff Den Press on Fb & twitter. We would have to choose between Vashti (Siamese) or Jonah (tuxedo) ... Oh dear! I follow Michelle Wolff on Twitter. I like Wolff Den Press on Facebook. If we win, we'd like a portrait of Jewel. We know we've e-mailed you before, but if you don't have it, our e-mail is: fureverywhere [at] gmail [dot] com. We would love one of Ellie to give our Daddy!! We follow you on Pinterest. Katie, your portrait is beautiful! (And look at all that snow outside...) We would love to have a portrait done of winking Ashton. That is a gorgeous portrait of you Katie. Wow, we all want our portraits done, but since I'm the oldest...it will be me! We follow you on FB. We follow Wolff Den on FB. We follow Wolff Den on Twitter. That is beautiful. We'd like to have a picture of Angel Sweet Praline. There are many cat artists out there, but I have to say Katie, even the texture of your furs was captured by this amazing artist. We would love a portrait of our Angel Tom whom we lost this year. That would be something special. We liked Wolf Den on Facebook. What a talented artist! We would love one done of our Angel Cerise. Wonderful - count us in. We'd love a drawing of Seppo. And we follow glogirly on fb, of course. 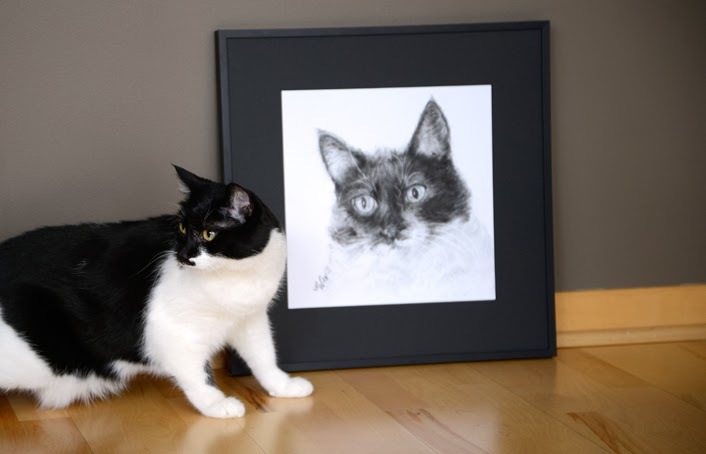 The portrait is lovely- but having such a beautiful model must surely help! We'd love to see what the talented Michelle could do with Mickey Mouser. Very talented. Ah Glogirly...will you get one of Waffles done? wow what a great giveaway! I would LOVE one of these! I would Like to have a prtrait of my Siberian Husky Mika. She is black and white and 4 years old. I follow Wolff Den Press on FB. I follow Wolff Den Press on Twitter. I follow GLOGIRLY on FB. I follow GLOGIRLY on Twitter. I would have Mr. Gatsby's portrait done. He's my 5-year-old Cairn Terrier. Wow, what an AMAZING contest! 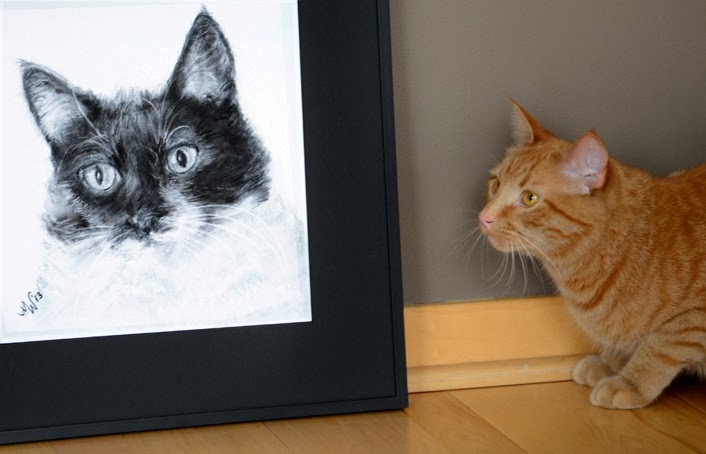 That is such a beeYOUtiful pawtrait. I would love to have a pawtrait of my kitty brother Scribbles for Momma's Christmas present. My email address is dreagoddess(at)gmail(dot)com. Oh my fabulous! Please enter us! I will follow you on G+ if we ever figure out how to use it. I follow Michelle on Twitter! Katie, your picture is beautiful. It would be a hard decision between my sweet Kameko (who I lost 3 years ago) or my current darling Callie. That's a BEAUTIFUL portrait of you, Katie! We would LOVE to be entered in the giveaway. Mowzers, how cool is this? Momma wants a portrait of Maxie so she can remember him while he's away at Betty Furred Institiute. We follow Glogirly on Twitter! We follow Glogirly on Facebook! We tweeted about the giveaway on twitter! Amazing work. We would love a portrait of any one of our six cats! Perhaps it will be Hansel, the most shy, elusive cat that is rarely photographed or spotlighted. He is gray with tuxedo shirt and stripes on front paws and white undercoat. A stray cat with regal features. Or Jean Pierre my first rescue kitty. Or even Ma Cherie, the dog who loves her sibling cats. I could keep daydreaming but will wait for contest results! Would love to feature Romeo, a colony, Black cat to show that community cats are cats too! This is very important information and we love how Waffles & Katie educate in a fun way. It's our comic strip of the day to laugh, smile and learn! I would like to win a portrait of myself to give to the lady for Christmas. Of course, I wouldn't mind looking a piece of art depicting me...there are no mirrors at eye level in this place. You know where to find me. Hee hee. Her work is AMAZING!!! Of course I would love a portrait of both of my boys but I must say that I think Dakota's handsomeness would be the perfect subject! Mowzers! We just liked Wolff Den on Facebook! AND we follow her on twitter! Allie: oh Katie, that portrait so perfectly captures your soulful eyes. ANY artist competent enough to sketch the Great Katie is indeed talented! Allie: *squeeee! * AND we follow you on Google Plus, too! Let's make your life easier! We are following you ALL in ALL the right places and following the talented artist in all her places too! OK you can go and lie down now! We always follow Glogirly on Facebook! We already follow Glogirly on Twitter! And lastly, we follow you on Pinterest! wow, what beautiful kitties. We would want a picture of Shoko Neilson...she is on facebook and she is our kitty bab. However after saying this, I found Waffles a handsome kitty as well. As an artist myself who too specializes in pet portraits , I am always painting other people's pets and not my own. I would love a portrait of my sweet Tess Anne who has a fabulous personality and is so photogenic. As I can't decide between the two rescues I currently serve and adore, I'd have to say I'd love a portrait of our first family cat. Miss her! I follow you on Google+, my only social media site. I would love a custom portrait of my cat "Cheesecake!" I follow Waffles on Twitter. Pop follows you on Facebook. I would love to have a picture of my beloved BearBear. Thanks for the wonderful giveaway. Love Katie's portrait. I'd love to have a portrait of my miniature poodle. Katie your portrait is amazing the fur on your ruff is so lifelike. I would love to have a small chance to win a portrait. My Mom's e-mail is maloni@nycap.rr.com Thanks muchly. We followed Wolff on Twitter. I tweeted about your link on Twitter today also. What a BEAUTIFUL portrait of you Katie. Just gorgeous. Of course, I would most like a portrait of me however, I think the peeps might like one of my brother Desdemona 'cause he's no longer with us and I know they miss him a lot. Hi Glogirly, What a hard task to choose one for a portrait but I think it might have to be Magic as little Red already photographs easily. Wowzers! You're like that Mona Lisa babe! How cool is that?!?! If we won, it would be too hard to choose, so we just want to wish everyone else good luck!!! What a NICE offer!!! Oh what wonderful pictures!! You look great Glogirly! We would love one of these portraits! Michelle is a gifted artist. It's really difficult to capture the essence of a cat. If we won, we'd choose a portrait our old boy Merlin since he won't be around much longer. I just liked her on Facebook! Trying to keep my entries spaced out. i follow glogirly on google+. i just liked Wolff Den Press on FB. That's gorgeous Katie! Looks just like you! wow !! absolutely stunning ! I would love a portrait of YoYo my little Min - Pin .He has become my best Friend since my Husbands sudden passing.